John Michael Bernil is a fifth-year biology major at the exclusive Ateneo de Manila University in Quezon City but he is quite unlike most of his schoolmates, many of whom belong to the country’s upper classes. His mother struggles financially to put him and his siblings through school, forcing the family to scrimp on what many of his wealthier classmates consider bare necessities. 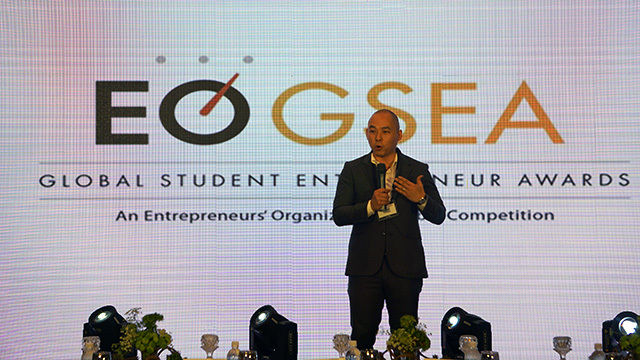 “We only use the aircon for two hours a night,” Bernil told the judges during the final segment of the Global Student Entrepreneurship Awards (GSEA) contest sponsored by the Philippine chapter of the Entrepreneur Organization on February 10. “My mother scolds us for turning on the aircon while covering ourselves with a blanket to keep warm,” he shared. 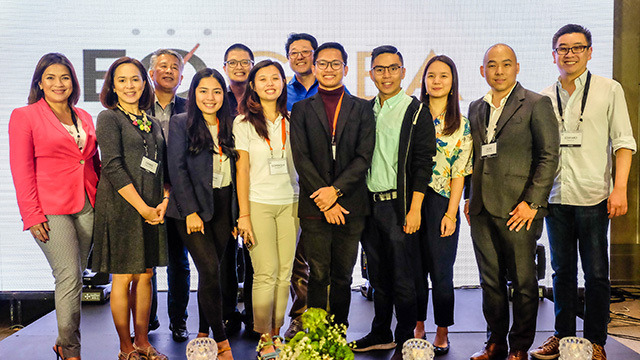 Bernil won the Philippine leg of the contest, besting four other young business founders from Ateneo, Peking University and University of Asia and the Pacific (UA&P) who made it to the finals. He won $1,500 plus a free trip to Toronto, Canada where he will represent the Philippines at the GSEA Global Finals in April 2018 to compete with student entrepreneurs from over 50 countries. The global winner will get a prize money of $20,000. 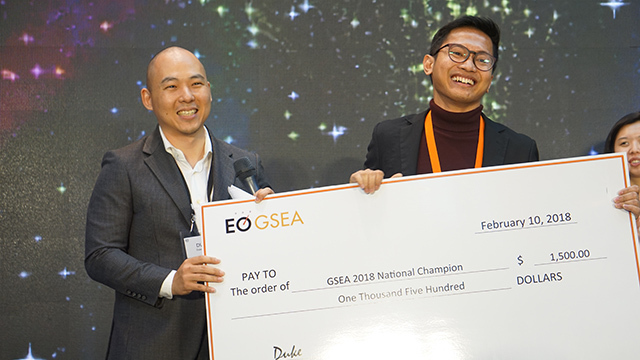 Unlike other youth entrepreneurship contests that select the best business plans or ideas, the GSEA is open only to students who have already put up a business that has earned revenues of at least $500 or raised a minimum of $1,000 in capital. Bernil more than meets those minimum requirements with his startup company, Exora Technologies Inc., which built an online auction platform to help big power users find the best supplier for their electricity needs. Incorporated last year with two of Berni’s schoolmates, Exora created an automated system that quickly matched demand from large electricity consumers with average peak demand of 750 kilowatts (KW) with supply from retail electricity suppliers (RES) based on cost and other operational parameters. Starting with just a seed capital of Php20,000 from each of the founders, Exora has won an initial funding of at least Php5 million from a serial angel investor. It expects to earn Php50 million this year and Php500 million over the next five years. Before Exora, large power users typically took up to six months to firm up contracts with retail electricity suppliers. Exora helps cut the process to just weeks, said Bernil, who got the inspiration for the business from just attending a weekend seminar for students on the power industry sponsored by the American Chamber of Commerce. Exora’s growth potential is huge, considering there are close to 2,000 electricity users whose peak demand exceeds 250 KW throughout the country. He is eyeing to aggregate the electricity requirements of those users to help them get better price and other terms from suppliers. In a sign of the company’s bright prospects, an electric utility has offered to buy Exora Technologies for around Php120 million, Bernil told the contest judges. However, he and his co-founders decided against selling out because they estimated that the company is potentially worth more the offered priced, based on the present value of its future cash flows. Bernil revealed they’re in talks with a venture capital (VC) firm that has valued Exora Technologies at $10 million or more than Php500 million. He said the company needs VC funding to expand to other Asian countries, notably Singapore and Japan. Founded in 1998 by Saint Louis University in the US, the GSEA is the premier global competition for students who own and operate a business while attending college or university. This is the fourth year the GSEA competition is being sponsored in the country by EO Philippines. - Christine Tiu, a 24-year Filipina student at the Peking University in China who founded AMAMI, a social enterprise that helps create a bigger market for jewelry and fashion accessories made by poor but skilled craftsmen. Roel Landingin is the editor-in-chief of Entrepreneur PH. He was a guest judge at the contest.